The research area nuclear, particle and astrophysics (KTA) deals with the understanding of our world at the subatomic scale, from the nuclei inside atoms down to the most elementary building blocks of matter. Jean-Côme Lanfranchi from the Cluster of Excellence "Universe" prepares a cylindrically formed detector crystal for a test. At the left, the cryostat that can cool the crystal down to ten millikelvin. Foto: TUM/Heddergott. The origin and structure of matter in the universe together with the role played by the different interactions and symmetries in the development of the universe from the Big Bang up to the still ongoing production of heavy elements in stars and in star explosions are matter of investigation within this research area. From a theoretical point of view the electromagnetic, weak and strong forces can be described within quantum field theory but this leaves out the gravitational force. For this reason one of the objectives of the ongoing research is a common description of all fundamental forces within the same model. Spokesperson of the research area KTA is Stefan Schönert. Interaction of a pion beam (from the left) within a bubble chamber filled with hydrogen. Foto: CERN. The question about the nature of the fundamental building blocks that compose our world was already debated by our ancestors. Modern experiments have allowed us to look deeper and deeper into the structure of matter and to identify smaller and smaller matter constituents. With experiments at the largest accelerators worldwide, like today at the Large Hadron Collider (LHC) at CERN in Geneva, it is possible to produce the most elementary particles and to study their properties. Indeed, precision experiments can measure known particles and their symmetries and the experimental results can on the one hand be compared to the theoretical predictions by the Standard model of particles on the one hand, that provides a common framework for all existing particles, their interactions and the underlying symmetries and on the other hand test new theoretical predictions beyond the Standard models by looking to new particles or unexpected deviations in precision measurements. 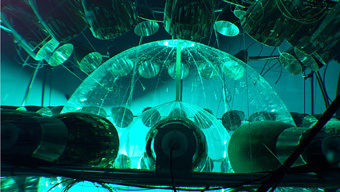 Investigating solar neutrinos: the Borexino experiment at Gran Sasso, Italy. Foto: Henning Back/Virginia Tech. Astroparticle physics represents the gateway between astronomy, astrophysics, cosmology and Nuclear- and particle physics and deals with the links between the big structures in the universe and the smallest building blocks of matter, the forces between them and the underlying symmetries. From astronomical observations we know today that the visible form of matter constitutes only a quarter of the total amount of matter and only 5% of the total energy density in the universe and we are still searching for the particles that compose the so-called dark matter. 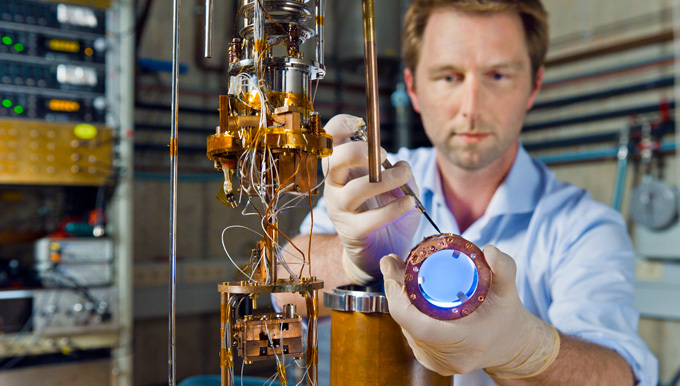 The properties of neutrinos are also subject of investigation within astroparticle physics. In particular, we would like to study how neutrinos produced in stars change their character while travelling to the earth and possibly transform into their antiparticles, as the role played by neutrinos in stellar explosions and in the central core of earth. 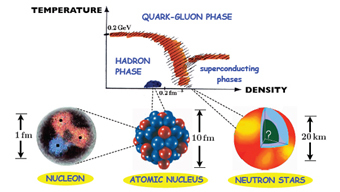 Hadrons as protons and neutrons are composed out of quarks that interact by means of gluons. We know that the strong interacting hadrons, among which the best known are protons and neutrons, are composed of more elementary building blocks that are interacting and also kept together by Gluons. We want to understand in detail why the proton is 50 times heavier than the sum of its buildings blocks or how the spin of the proton results from the dynamic of its constituents. Also the interaction between neutrons and protons within atomic nuclei and how this is linked to the properties of the elementary building blocks and which role the different atomic nuclei played in the formation of the heaviest elements in the universe is matter of study in this branch of physics. Heavy ion collisions at the accelerators help studying the hadron properties with different quark contents and also how these interact within dense and hot nuclear matter. 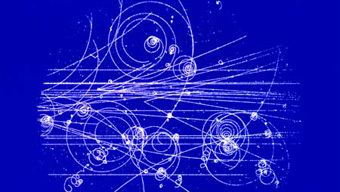 One can even recreate a plasma of free quarks and gluons as probably it was the case shortly after the Big Bang. 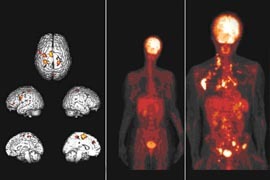 The Positron-Emission-Tomography (PET) displays regions with larger metabolic activity (lighter spots). Many technological development from fundamental research within KTA have found applications in the every-day life or in other research areas. This is the reason why many different diagnostic methods in medicine, like MRI and PET are by-products of the KTA research. 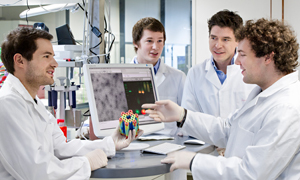 Today photon, ion and neutron beams are regularly used to treat tumors. Modern research in the field of the medical diagnostic based on the very modern detector technology and that utilize ion and neutron beams for application in biophysics and for the study of different materials are further example of these kind of applications. MLL is dedicated to experimental and theoretical research and teaching in the area of nuclear and particle physics. 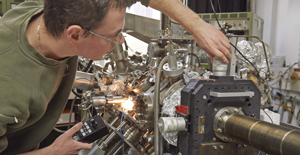 It contributes with important developments of many experiments, which are carried out at large scale facilities such as CERN, the underground lab at Gran Sasso in Italy and GSI in Darmstadt.